The libertarian shill for industrial food, Jayson Lusk, is back with a new book, this time defending “pink slime”, the meat filler made from beef scraps that found its way into most hamburger sold in the U.S. until the public got wind of it and forced it off the market. I have no use for his anti-government screeds and the nonsense about techno-utopias, the moral authority of markets and disruptive innovation. Lusk’s faith in the infallibility of the kitchen robot is almost touching: “The robot doesn’t forget whether it added an ingredient, how long the onions have been sautéing, or when to reduce the heat.” You’d never be able to tell the difference between the robochef’s handiwork and that of the master chef. 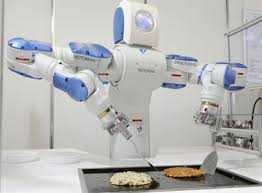 “Actually, the robot would make the dish precisely the same every time, whereas even the best chef” — pace Bobby Flay — “is known to make the occasional mistake.” Such a machine, he crows, could make the entire kitchen obsolete. Why would we want such a thing? The idea that our lives are diminished when we make an occasional mistake such as burning the onions is ridiculous. It’s the imperfections in life that give it character, make humor possible and provide us with occasions to learn, especially when the mistakes are of little consequence. What does it say about us if we are so afraid of burnt onions that we are willing to sacrifice whole dimensions of life to avoid them? And why would we want a dish made precisely the same way every time? I can see why a restaurant might find that consistency compelling. But at home? No variation, no serendipity, just boring homogeneity—an ideal for people like Lusk who seem to have an irrational fear of contingency despite their incessant bleating about freedom.